This is what you make for a little Florida girl having a birthday in November. Simple shirred sundress with front pocket. Ribbon straps and ribbon trim. French seam up the back (I love saying I sew French seams ... sounds so sophisticated, like I know what I'm doing). More images here, here, and here. 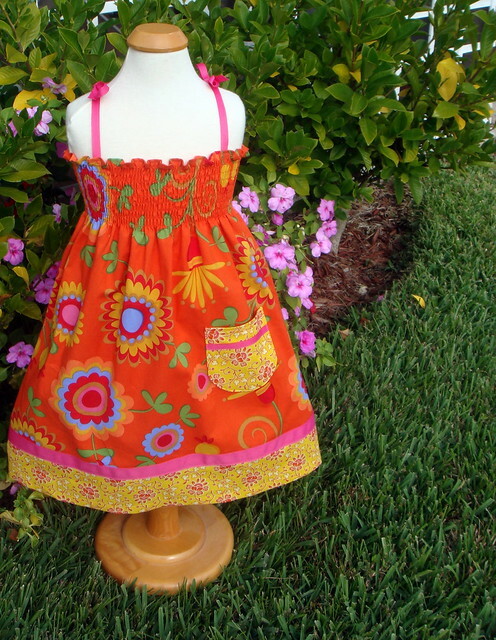 Love this cheerful birthday dress! It is perfect for a November birthday in Florida...or anywhere. That's beautiful! Makes me wish I had girls. I'm loving your new header! It looks fantastic!